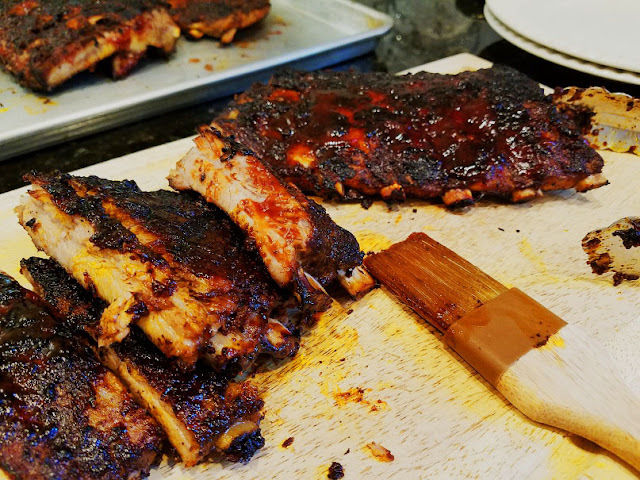 Now that you've had overnight to let your ribs absorb all those yummy spices and seasonings in the refrigerator, it's time to cook those babies up! Day 2: The Cooking and Eating! First, you are going to pull out your ribs from the refrigerator, grab a measuring cup (2 cup), some honey, some minced garlic, and a beer. 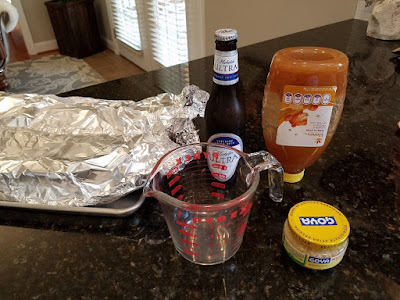 Squeeze a dollop of honey (about 1 tablespoon) in the measuring cup, along with 1 tablespoon of the minced garlic, and about 3/4 of the beer (drink the rest!). Put the measuring cup in the microwave for 1 1/2 minutes, just until the mixture is hot (not boiling), and stir well to incorporate. 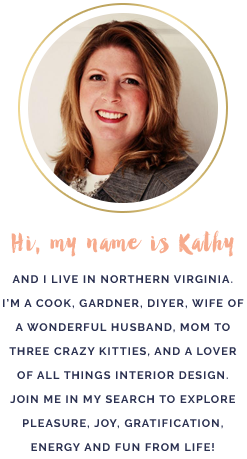 Take your ribs and re-open those non-crimped ends. 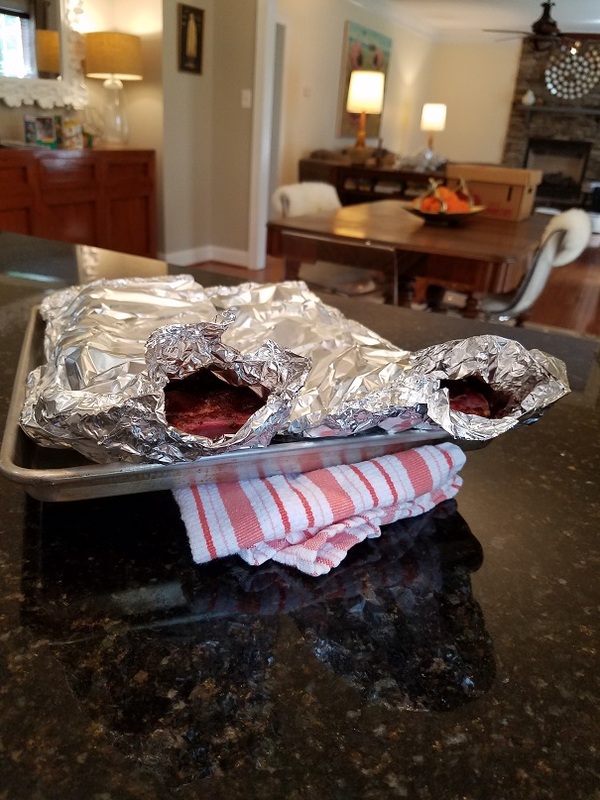 Place your ribs (preferably on a cookie sheet) on a tilt by putting a folded kitchen towel under one end. 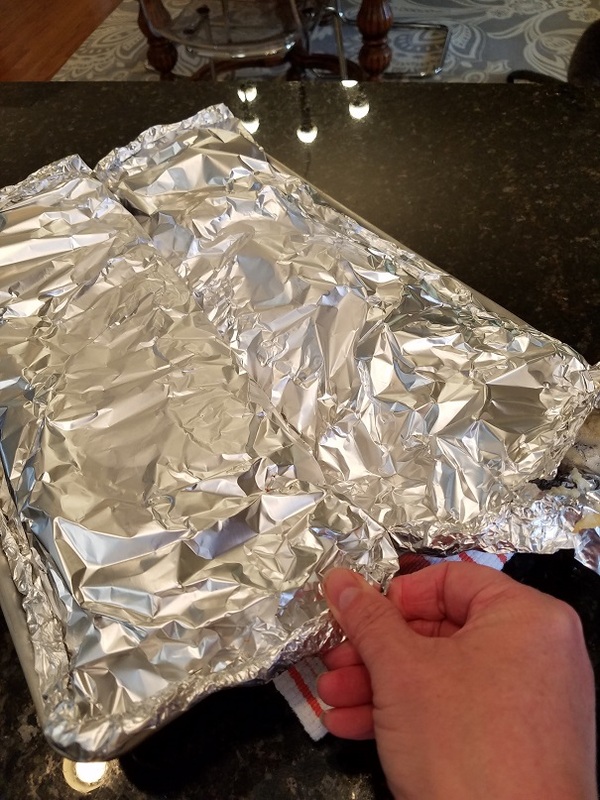 You don't need to do this if you have another person propping up the cookie sheet, but I find this to be the easiest way. 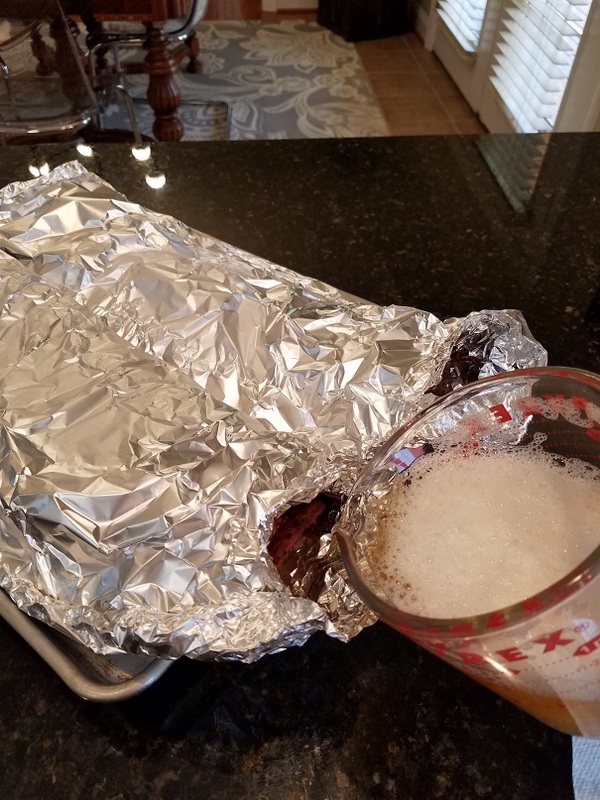 Pour your beer mixture equally in the openings for both racks of ribs. 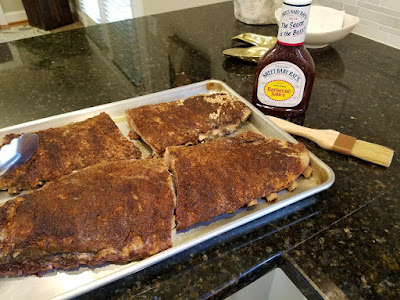 The tilted cookie sheet/ribs allows for the beer mixture to go all the way to the other end of the ribs and not spill out the front. This is why it's really important to crimp those tin foil sides together tight, as you don't want the beer liquid running out all over your kitchen counter! Now crimp those open ends closed and tight! Place the ribs in the oven for 2 1/2 hours to cook. After 2 1/2 hours, take the ribs out of the oven and carefully re-open your crimped ends and drain off that liquid inside the ribs. I find it's easiest to do this by tilting the cookie sheet over the kitchen sink. Sometimes I save this liquid to boil down and make my own BBQ sauce, but I only do that if I make my own dry rub and marinade. Now, grab your favorite BBQ sauce and fire up the grill! I like to cut the racks in half, as they are easier to handle on the grill. Grill the ribs for about 20 minutes, or until nicely charred, while basting with sauce. All you're doing on the grill is giving them some grilled flavor and carmelization, as they are already completely cooked from the oven.